I am ahead of schedule today as normal, I have no schedule or need to plan, at least no I-NEED this or that I-NEED that to plan, mostly just I want. So, being ahead of schedule, on top of the world, I went for a morning walk up the hill form the Mandela Auberge. I am told there is a market today, so I set off to see who is also ahead of schedule. First thing off, the girl across the way is cooking bread, and is bound and determined I will have the best photos possible. 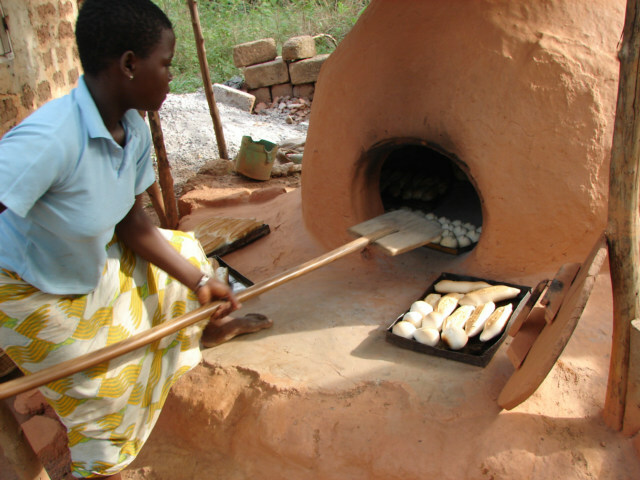 She also sold hot bread right out of the oven, T-Bread I think is the name, two pieces for 100 CFA, about 20 cents U.S., what a pleasure. I work my way up the hill, slowly choosing my steps, knowing I have nothing better to do than look. The red stone, the red dirt, the color of Africa always makes me think, this color of Africa in photos gives the impression of harshness and difficulty, it really is not good representation of Africa, in the color of dirt. I start to enter, or weave my way into the market, there are many red dirt paths to choose from, it is a normal market, like most markets on the planet. 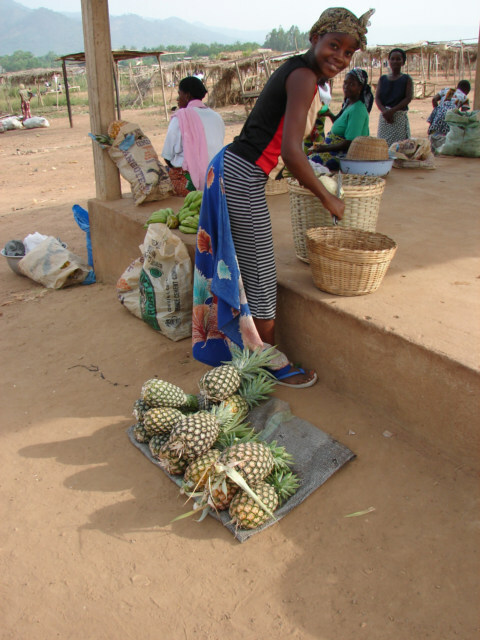 However, presently, it is delivery time, the early venders are having pineapples, bananas, plantains and various other fruits and vegetables taxied into the market. I am preoccupied with the bananas, then a girl of 18 runs by, chasing the taxi to retrieve more Pineapples, I thought it was my friend Tanz, and called out, by the time I was done, I realized, not the same girl, but both are banana sales job. The bananas are too green, I think about 2-3 days out before eating is good, and I think they sell these wholesale, then the locals hold onto them and sell them all week long. So, I started to look at the pineapples, the girl is encouraging me, I try to explain, I do not like to cut up the pineapple, she says she will and I am happy, although I think, the pineapple looks too new, maybe it is still hard, I like a nice soft sweet pineapple. She cut it up, smiles, pushes, prods and laughs and shoves, she and the bread girl have made my morning all things good and happy. The pineapple was soft, sweet, and delicious, now I need to learn to say, delicious and sticky in French. There is a good memory associated with delicious and sticky, I will remember these words.